Of course, as is the case with so many studies regarding wine consumption, this one comes with a now-standard caveat, noting that Time Magazine pointed out that “The study is likely just a reflection that 'maternal education and income tend to be higher in light drinkers.'" This is a fascinating area of research, and a personally relevant one, too: During our first visit to the doctor this past spring, he told my then-newly-pregnant wife that a bit of wine would actually be a good thing for her from the fourth month on, noting this new research. 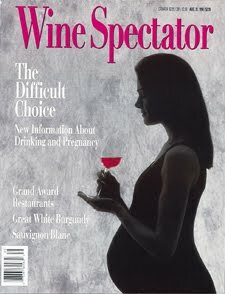 This is not the forum to discuss how we’ve chosen to handle The Wine Question these past several months, but the column does bring up a fascinating question: Is the general American aversion to all alcohol during pregnancy a remnant of older belief systems and science that should be reconsidered in light of new research, or is abstention still the best policy? Either way, as more research seems to imply that very moderate wine consumption is beneficial, it’s an issue we’ll have to grapple with in the coming years.